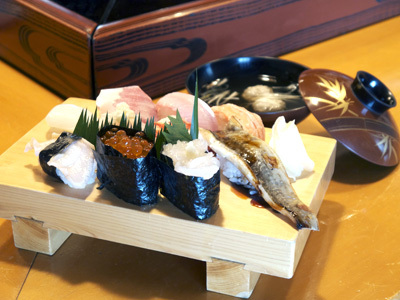 This sushi shop features local fish directly obtained from the Himi port, as well as local sake from Toyama Prefecture. The names of the toppings are written directly inside the case on the counter, so you can easily understand what you order. You can also taste local fish surimi in the miso soup provided with the lunch set. This shop is committed to using ingredients from the region. Copyright (c) 2011 Toyama bay sushi All Rights Reserved.